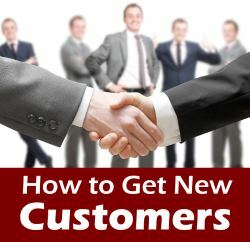 Getting new customers for your business is hard work, but it's necessary if you want to be successful. Here are 10 ways you can get the attention of new prospects and turn them into loyal customers. Your business needs a steady influx of new prospects in order to be successful. Whether you’re in sales and looking for new customers or you’re a freelancer looking for new clients, you need to know how to attract prospects to your business. While the rise of the Internet over the last couple of decades has forever changed the way that business is done, the top professionals know that getting new prospects and retaining clients requires a mix of old and new techniques. If you’re looking for a leg up as you prospect for new customers, here are ten helpful tips to get you started. The first step to acquiring new prospects is to use social media to your advantage. Creating Facebook, Twitter, Instagram and LinkedIn accounts for your business is free and can exponentially increase the exposure of your company. More importantly, since these platforms have become ubiquitous, prospective clients may be turned off if your business doesn’t have a social media presence. Consistently updating your website and social media accounts with new content is a great way to stay relevant and show prospects that you’re actively engaged with your industry. Find articles, infographics or studies that are related to your business and post links on your social media accounts. Additionally, it can be helpful to maintain a weekly blog to showcase your own opinions and personality. One of the best ways to attract new prospects is to show off your existing ones. If you know that you’ve provided a customer with a particularly positive experience, ask them for a testimonial. These testimonials don’t have to be elaborate or embellished. Simply providing proof that you can deliver on your promises will help to give faith to prospective customers. Making use of the Internet can go a long way towards attracting new prospects, but personal connects are the lifeblood of business. Whenever possible, engage with prospects and clients face-to-face in order to give them a personalized experience. By making an effort to get to know everyone you work with individually, you can create a stronger bond, increasing the likelihood that they decide to do business with you. It’s human nature to follow a set routine. As you prospect for new clients, don’t be surprised if you encounter resistance from people who feel set in their ways. If you sense that a prospective client is hesitant about doing business with you, listen to his or her concerns and do your best to address each of them accordingly. One of the easiest techniques for finding new prospects is to make use of your existing customer pool. Talk to your clients and see if they know of anyone who could also benefit from your services or expertise. Remember that word of mouth can be incredibly powerful, and by having an existing client refer you to a prospect, you can greatly increase the likelihood that you land the new customer. Thank you a lot for providing individuals with an extraordinarily terrific chance to read articles and blog posts from this website. It’s usually very great and stuffed with a great time for me personally and my office colleagues to visit your web site at a minimum thrice a week to read through the fresh items you have. And indeed, I’m so actually motivated with all the sensational solutions you give. Some 2 areas in this posting are truly the very best we have ever had. My spouse and i have been quite ecstatic when Jordan could deal with his web research via the ideas he grabbed from your very own weblog. It’s not at all simplistic to just be giving away tricks which often people could have been trying to sell. And now we acknowledge we have the blog owner to give thanks to for that. The explanations you have made, the straightforward blog navigation, the friendships you make it easier to promote – it’s got everything sensational, and it’s facilitating our son and the family recognize that the matter is brilliant, which is certainly unbelievably important. Many thanks for the whole thing! I simply wanted to make a brief remark to thank you for all the fantastic tips and tricks you are posting at this website. My particularly long internet search has at the end of the day been recognized with beneficial knowledge to talk about with my company. I would claim that many of us visitors actually are truly lucky to live in a wonderful community with so many brilliant people with insightful basics. I feel truly privileged to have discovered your web page and look forward to really more pleasurable minutes reading here. Thank you once again for all the details. My husband and i got so fortunate that John could conclude his studies via the ideas he came across from your web page. It is now and again perplexing to simply find yourself giving for free tactics which often most people might have been trying to sell. We really fully understand we need the writer to appreciate for this. All of the illustrations you’ve made, the easy website menu, the relationships you help promote – it’s got all excellent, and it’s really assisting our son in addition to the family understand that theme is cool, and that is extremely pressing. Many thanks for everything!